A motorist slapped a woman and took her cellphone after she got into an argument with the driver while she was riding her bicycle in Shaw this past weekend, police said. The bout of road rage happened on the 1800 block of 9th Street NW about 2:15 p.m. Saturday. 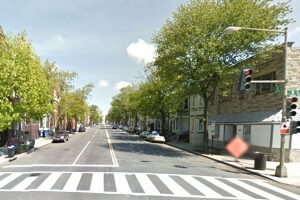 The cyclist was about two blocks west of the Shaw-Howard University Metro station when someone in a black Honda went into her path, almost hitting her, according to authorities. The motorist and the cyclist yelled at each other soon after. The driver then intentionally swerved toward the woman, who hit the car with her hand. “Why did you hit my car?” the motorist asked, before getting out of the vehicle and slapping the woman multiple times, according to authorities. The cyclist eventually said she was going to call the police. “The f–k you are,” the motorist said, while grabbing the woman’s iPhone, according to authorities. The driver then got back into the car and drove away. Police haven’t distributed a description of the suspect. A man also was seriously injured by an ottoman footrest that someone threw off the roof of a building in NoMa Friday, according to authorities. The incident occurred on the unit block of M Street NE about 6:15 p.m. The victim was walking down the block when the footrest hit him on his head, police said. He was brought to a local hospital for treatment. Authorities haven’t released any suspect information. Black male, 18-25 years old, 6′, wearing light blue overalls and a black t-shirt. A robbery with a gun on the 400 block of Columbia Road NW in Park View about 11:45 p.m. Friday. Police haven’t released a suspect description. 2 B/M’s, 1 wearing red sweater/ black coat armed with a black handgun. Suspect (2) 6’0″, wearing blue jeans and a blue coat. B/M, late 20s to mid 30s, wearing a Navy Blue Jacket with a Red Stripe.